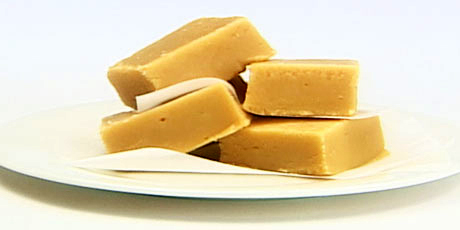 Fudge: sweet, soft and will melt on the tip of your tongue! 1. Grease an 8-inch square pan and line with parchment paper so that it hangs over the sides. Stir evaporated milk, brown sugar, white sugar, butter and salt in a heavy-bottomed saucepot. Bring to a boil over medium heat, stirring often, and cook until 238 °F (use a candy thermometer to gauge). Remove from heat, stir in vanilla and Irish Cream and scrape into a bowl or mixer fitted with the paddle attachment. With the mixer on low speed or electric beaters, add in the icing sugar in three additions, mixing well after each addition. Scrape fudge into prepared pan and let cool completely before slicing.